Your time and kind words means the world to me. Deepest appreciation my dear friend! Thank you my friend. Very Much appreciated! and always a pleasure to hear from you. photos of her...:) Thanks so much for looking and commenting my friend! Wow your critique blows my away my friend! such a nice surprise! You are way to kind Srna. Thanks for making my day before my day even starts! congratulations on your well deserved Awards, bravo! Thank you so much David. Deeply appreciated! Thank you Nanda. Happy for your visit and much appreciate the kind supportive comment! ....:) I like that! Thanks for the wonderful comment Jose. Appreciate you looking and taking time to comment my friend! Thats a beautiful one with more colors. And you captured him very well. 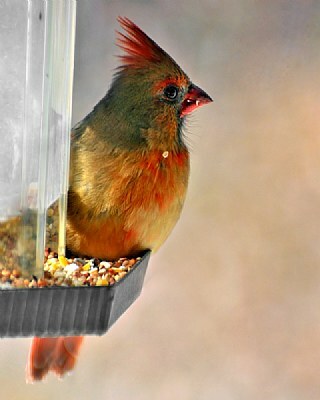 A wonderful shot of the female Cardinal. Thought she could eat in peace but you caught her in the act LOL! Thank you Fabrice!! Love your critique my friend. Deepest appreciation for the in depth critique! WoW dear Paul, what a pleasant and colorful frame ... fantastic focus and expression of the Beauty ... so interested it is ... wonderful light, absolutely fascinating and impressive photo :) Well done :) Bravo. :-) So cute Paul.... Captured at the right moment to get this eye looking in the future....We have the feeling that this bird is thinking to something particular. Im happy you like the photo Jose!! Hermosa foto! Buena captura y composicion! Very fine photo,colors is ok. It looks so excited, probably new it will be recorded forever. Like it Paul, cool and good. Well.... Im glad you liked this Kamran!